The following is the final mission report of Mars Desert Research Station (MDRS) Crew 166 (Mission to Mars UCL). 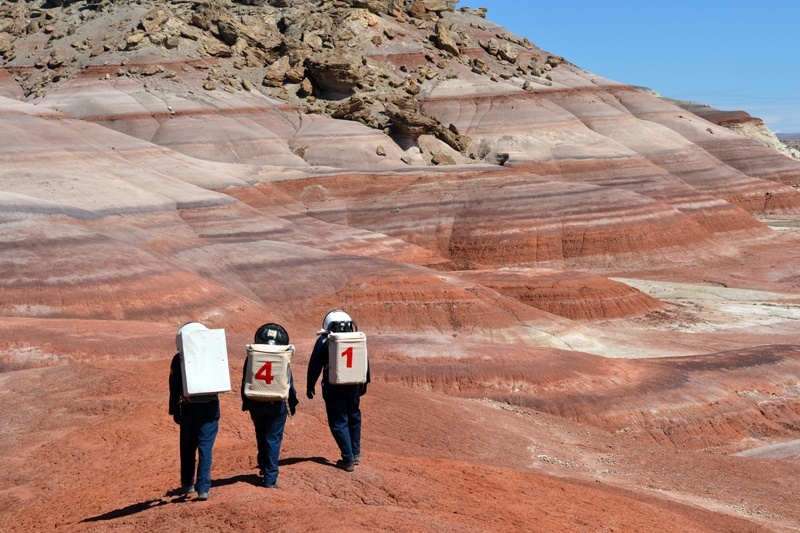 A full review of this year's MDRS activities will be presented at the 19th Annual International Mars Society Convention, to be held September 22-25, 2016 at the Catholic University of America in Washington, D.C.
Stationed at MDRS from March 19th thru April 3rd, Crew 166 consisted of six students from the UCL (Université Catholique de Louvain), a Belgian university. It was the first trip to the Red Planet for all of the crew members, which included Mathieu Roiseux, Bertrand Steenput, Gregory Edison, Nadine Traufler, Julie Mertens and Arthur Bawin. When we prepared ourselves to go to Mars, we planned five major projects, all of which experienced various levels of success. My goal was to detect and characterize bacterial life in the desert soil. First at all, I collected 12 samples in diverse kinds of soil and in various locations: top of hills, dry streams, etc. I extracted bacteria from each sample thanks to a Ringer’s solution. First little problem, two samples were rich in clay and adsorbed the solution. It took a while to separate the solid phase of the liquid. A second time, I put solutions in LB media to start the microbial development, and next I separated the colonies in individual LB media to start the characterization. I used specific media like King B or Simmons citrate and biochemical tests (catalase and oxydase). The major problem that I encountered with was the environment. I tried to work in sterile conditions, but the closed space and the proximity of living space didn’t allow me to guarantee my results (and I don’t see how we can improve this question in the current situation). Fortunately, I did the media in Belgium which reduced the risk of contamination. The last thing I had to do is to compare the results of Florian Commans (Crew 153) and try to identify the different organisms. The first goal of this experiment is to provide a 3D map of the area close to the research station: in order to better foresee the EVA requests, an interactive map would help the crew members visualize the target area. The second feature of the project was to determine, using a simple algorithm, the quickest path to take to get to the station, in case of an emergency, for example. This path would be computed using both the iso-lines of altitude and a rough estimation of the grains size at some locations. The first step was to take a lot of elevation measurements, to make the map the most accurate as possible. This was quite an exhausting and repetitive job, since we had to climb small hills to get the highest altitude values, as well as walk down trenches to get the lowest, in order to capture as much as possible all the subtleties of the terrain. Those measurements were initially planned to be taken using a barometric chip for Arduino, coupled to a GPS module to record the locations. This would then require three satellites above Mars to simply get an (x,y) localization, since the altitude would be recorded computing pressure differences. Since an electronic GPS map was available at the MDRS, it replaced the Arduino system, as it was much more convenient to use. Moreover, this GPS could record a whole track, taking the altitude at equal time or distance, during a whole EVA, providing a .gpx file, which just had to be formatted as a .txt file to get the whole track. This would, however, require a fourth satellite above Mars to add a z-location. Once all the data was collected, the next step was to produce a smooth surface, matching the real data according to given criterion. This operation was done using the software Matlab and a C code IDE, for their graphic illustrations and execution efficiency, respectively. Since the soil close to the station was quite uniform, it didn’t seem relevant to take grain sizes into account, as it wouldn’t make a significant difference in the path computation: the minimal time path would then be obtained using only the altitude data, as it would be naturally travelled by the crew members (it was initially computed using values defined between grid points as a weighted average of the altitude difference and the grain size, the following being quite uniform). An improvement of the map would be to compare the results with different interpolation methods and try to provide an estimation of the error vis-à-vis the actual topography: such estimation could be done with kriging methods, but would need a complete and longer investigation. The objective of my experiment was to place small receptors around the base or along tracks that we would often pass near danger zones. I or one of my fellow crew members would wear an emitter device with a small buzzer that would ring when we approached one of the receptors. What I consider a danger zone includes the following elements: holes, canyons, cliffs, etc. The few first EVAs we used to locate and place the receptors near those zones. We located a total of five zones that could be considered hazardous: two hardly detectable holes, two dangerous holes along the roads (which could be dangerous while traveling on ATVs) and one small hill with rocks on top (some rocks already seemed to have fallen and we thus had to be cautious). Different tests were then carried out to determine the characteristics of the receptors: the distance before the buzzer started to ring, the time it took it to ring, what happened if obstacles were located between the emitter and receptor and the time those emitters could function before the batteries were drained. Here are the results I collected, which I think are quite positive: the buzzer started to ring about 20 meters away from the receptor with about one second computation delay. Obstacles were a big disadvantage since they completely blocked the communication, which meant I had to be careful that the receptor was placed in a clear area or on high grounds. Finally, it took one week for the receptors to completely drain their batteries. This was one of the big disadvantages: I thought it would take them more than three weeks to empty their batteries, but it seems the temperature fluctuations and the small LED attached shortened their life-span. One improvement I didn’t have time to test was a small solar panel with rechargeable batteries. This would have allowed the receptors to work over an extended period of time, considerably longer than three weeks. On Mars and at the MDRS, the only means of communication between EVA team and the hab is the radio communication involving handheld radio. This kind of radio doesn’t have a range beyond two or three kilometers. In addition, with a hilly terrain, the range will obviously decrease. This absence of communication when far from the hab can lead in problems if the EVA team needs supports from the hab. The aim of my experiment was to test two prototypes that might possibly increase the communication range and check the feasibility of using them in the field. The first prototype is a radio relay. The relay is composed of two handheld radios and a repeater. The whole package is in a box that can be carried by the crew during an EVA and placed at a good location to serve as relay. The second prototype is a Yagi antenna. The Yagi antenna was built for the frequency of the handheld radio and made of ultra-light materials. It is used by the EVA team, so they can transmit important information to the hab. To use this antenna the EVA team has to know their position and the direction of the base. Indeed, the antenna has to be used while pointing it towards the station. To test the prototype, a handheld radio is wired through an audio cable to a computer. The computer is recording the whole signal received by the radio during the EVA. On the EVA side, a smartphone/mp3 is wired to a radio and is using a three thousand Hertz square wave. This was done to compare the received signal between an omni-directional antenna (the basic one), the relay and the Yagi antenna. To conclude, the experiment was a success. There will not be a lot of results since the Yagi antenna had numerous connector problems in the beginning, but many improvements can be made. The pointing system towards the base can be made automatized, the relay can be made more power efficient, multiple relays can be placed around the hab and activated on demand and the relay and the Yagi antenna can also be mixed. At the station’s Musk Observatory, we conducted a spectroscopy experiment, analyzing the light from celestial objects in order to know their composition. For this purpose, we used an optical fiber to connect the telescope to the spectrometer that was used for the measurements. A program sees the curve of the emission spectrum of the analyzed object. The data will be compared with the absorption lines of atoms and small molecules. We will conduct the first tests on Jupiter and then we looked at the brightest stars visible this season. Some of the stars observed were Sirius, Capella, Arcturus, etc. On Earth, the atmosphere interacts with the signal sent by astronomical object, but on Mars the atmosphere is one hundred time less dense and will not interfere as much with the data. The results were not the ones we were waiting for. Finally the Moon gave us some good results that we will analyze in detail later. We received a proposition to carry out an additional experiment. This one had been proposed by Heidi, a person who participated in two previous MDRS crew missions. Three of us were responsible for conducting a special EVA and collect data for her geological project. In the hab, we discovered the NorCal rover (a vehicle built by members of the Mars Society chapter of northern California). We tried to use it, but unfortunately smoke appeared. We found another problem - the eyes of the rover could not move. With some help from the person in charge of the rover, we were eventually able to solve those problems, take the rover outside and assist the crew engineer during his routine check. Finally, Julie, the crew biologist, used some coffee and ground samples to test radish growth. It appears that they grow better in coffee than they do in the mix of the two. All the more reason to bring plenty of coffee to Mars. As our first stay on the planet Mars, the experience was really interesting. I learned about the difficulties living with other people in such a small place and without sound isolation. Even if all went well between the crew members, having some time alone was noticeably missed. I will remember our stay at MDRS as an amazing moment. The EVAs are certainly the best part of a visit to the Red Planet. Seeing a huge area where no one has gone before, making experiments, etc. The bad moments seem better when we think about them later. If something didn’t happened as planned, we would find a solution. It’s a great experience on Mars because you know that you made it by yourself even if the CapCom gives you some indications and assistance. I’d like to thank all the persons who helped us during our pre-sim preparation and two-week stay at MDRS. Finally, I want to thank all the members of my crew for the job they made and the good moments we shared together. It was a real pleasure to be commander of Crew 166.